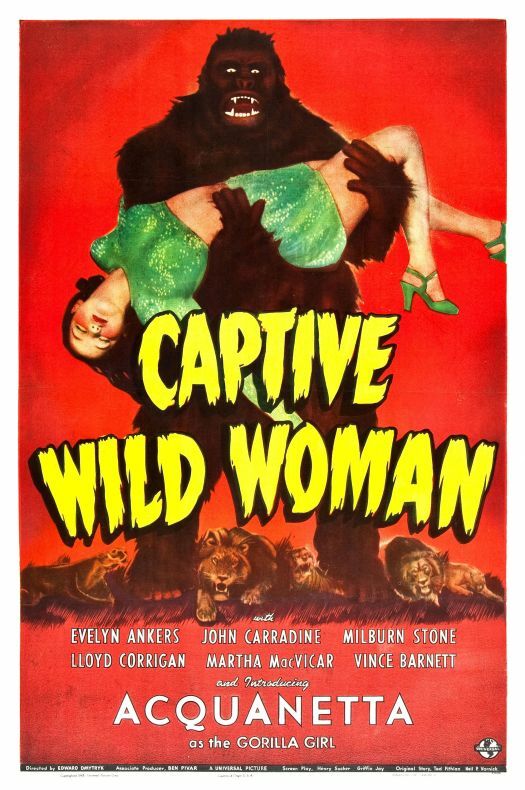 Universal decided the time was ripe for a new monster, and 1943’s CAPTIVE WILD WOMAN introduced the world to Paula Dupree, aka The Ape Woman! What’s that you say? You’ve never HEARD of her? Don’t worry, you’re not alone – The Ape Woman is the most obscure of the Universal Monsters despite the fact she was featured in three films, with various degrees of quality. The first is the best of the bunch, a fun little ‘B’ lifted by the presence of John Carradine in the first of his patented mad scientist roles. 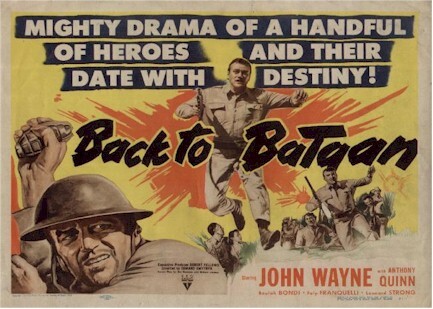 John Wayne and Anthony Quinn fight World War II on the backlots of RKO (subbing for the jungles of the Philippines) in BACK TO BATAAN, a stirring exercise in propaganda ripped from headlines of the era. The film was made to stoke audience’s patriotic fires, and succeeds in it’s objective. It’s well directed and shot, has plenty of action, and superb performances by all, including a standout from 14-year-old Ducky Louie. I recently decided that I wanted to watch and review every single movie ever nominated for the Academy Award for best picture. As part of that mission, I recently rewatched one of my favorite also-rans, 1947’s Crossfire. Crossfire is a message movie disguised as a B detective flick. A group of soldiers who have just returned from World War II decide to get together for a drink. At the bar, they run into a civilian named Joseph Samuels (Sam Levine). The soldiers end up going back to Samuels’s apartment and the next morning, Samuels is found dead. Obviously, he was killed by one of the soldiers but which one. Suspicion falls on the meek (and missing) Floyd Bowers (Steve Brodie) but police detective Finlay (Robert Young) and Sgt. Peter Keeley (Robert Mitchum) both (correctly) suspect that Samuels was actually murdered by the far more outspoken and imposing Montgomery (Robert Ryan). It quickly becomes obvious that Montgomery is an anti-Semite who killed Samuels solely because he was Jewish. However, neither Finlay or Keeley can prove it. The film quickly becomes a darkly intense duel between these three men as Finlay and Keeley attempt to trick Montgomery into implicating himself while Montgomery attempts to further frame Bowers for the murder. Before Crossfire, director Edward Dmytryk specialized in making low-budget “B” movies and he brings that noir, near-grindhouse sensibility to Crossfire. As a result, Crossfire is a one of those rare “message” films that is actually entertaining. Only a few times does the film start to feel preachy and luckily, Robert Mitchum is there being his usual cynical self. If anyone could deflate the pompous nature of the mid-40s message movie, it was Robert Mitchum. The film says, “Love one another.” Mitchum replies, “Baby, I just don’t give a damn,” and he keeps things from getting too heavy-handed. 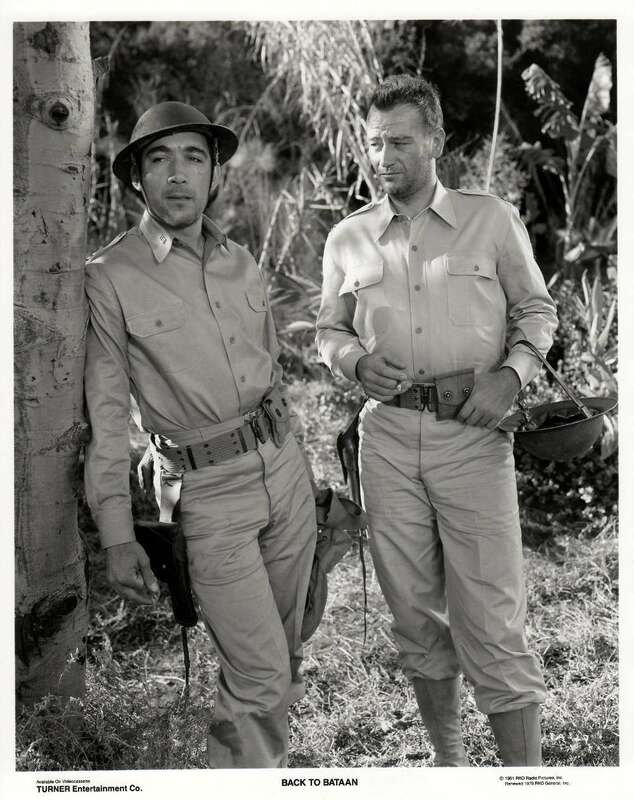 Mitchum is one of three Roberts to star in this film. Robert Young plays the police inspector with just the right amount of world-weary indignation while Robert Ryan is a force of nature as the film’s brutal murderer. Don’t get me wrong. You can pretty much peg Ryan as a killer from the first minute he shows up on-screen. If Mitchum and Young smartly underplay their roles, Ryan goes the exact opposite direction. He’s an obvious brute but he’s also totally believable. You look at his character and it’s not difficult to imagine him passing the collection plate at Westboro Baptist Church. As well, Crossfire also features an excellent supporting term by one of my favorite noir actresses, the great and wonderful Gloria Grahame. She plays Bowers’ married girlfriend and gives a compellingly, real performance that suggests that maybe Hollywood in the 40s wasn’t quite as clueless as we all like to assume. Crossfire was nominated for Best Picture of 1947 but it lost to another film about anti-Semitism, Elia Kazan’s Gentleman’s Agreement. (Oddly enough, both Kazan and Dmytryk would end up naming names during the McCarthy Era.) Like Gentleman’s Agreement, Crossfire was based on a novel. However, in the original novel, the victim was not Jewish but instead was gay. However, back in the 1940s, the Hollywood Production Code specifically forbade any open depiction of homosexuality and so, the crime went from being motivated by homophobia to anti-Semitism.